Last year, we brought you coverage of the fascinating auto body lightweighting talks at Automotive World’s Megatrends USA. 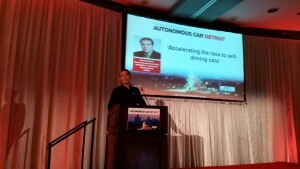 This year, Automotive World expanded the event to three consecutive days covering connected cars, autonomy and fuel economy. Our coverage starts today at 9 a.m. as experts explore the technology surrounding self-driving vehicles — as well as the challenges preventing them from realization. Tomorrow, we’ll continue on to the fuel economy segment, which will partially focus on the powertrain but still provide us with plenty of auto body-related insight. Check us out here for live Twitter updates from Dearborn, Mich., or follow along with @repairerdriven or #megatrendsUSA. Correction: An earlier version of this article incorrectly identified the organizer of the event. Megatrends was organized by Automotive World. The article has since been changed to reflect this.